alaTest has collected and analyzed 177 reviews of Sony HDR-PJ440. The average rating for this product is 4.3/5, compared to an average rating of 4.0/5 for other Camcorders for all reviews. Reviewers are impressed by the usability. The durability is also appreciated. We analyzed user and expert ratings, product age and more factors. 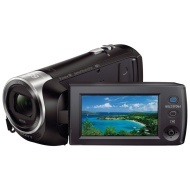 Compared to other Camcorders the Sony HDR-PJ440 is awarded an overall alaScore™ of 87/100 = Very good quality. alaTest has collected and analyzed 30 user reviews of Sony HDR-PJ440 from Amazon.com. The average user rating for this product is 3.7/5, compared to an average user rating of 3.9/5 for other Camcorders on Amazon.com. Comments about the usability and durability are overall positive. 77% of the reviews on Amazon.com give this product a positive rating. For the price, this is a nice, easy to use, small, light weight camcorder. But, picture quality (sharpness of recorded video) no matter the setting is less than desirable. Love the camera! But I wish it came with a controller. When playing videos on my tv, I'll have to get up everytime I want to skip a video or stop or play. The video is very good for the size of the camera. Very glad I bought it. The photos are pretty good. I like being able to take photos when I am taking videos without stopping the video. The projector feature was a very nice surprise. This is a nice small size for easy carting so far like it haven't tried it Yet to see how it records performances . Love the projection . Wish it had better pixels though . Easy to learn, to use, and it is the best thing I ever bought! Takes quality HD video up close and from a distance. Handles a 128 GB memory card very well. The projector not only works but gives a very clear image. I've used the on camera projector to show presentations and game video.